I don’t think I have had Schnitzel of any kind since I was in Germany, which was many years ago, so many it will age me! I remember it being crispy and saturated with butter; it was delicious. When I was poking around Simply Recipes a couple weeks ago I stumbled upon Pork Schnitzel and knew immediately, that we would be eating it very soon. Schnitzel is basically a cutlet and in Germany it usually is veal. While I love veal, Lenny is a little suspect so I knew this recipe for Easy Homemade Pork Schnitzel would be perfect. I was going to follow Elise’s recipe perfectly but when I got home I realized that I forgot to buy eggs and I could not possibly borrow another egg from my neighbors, I borrowed 3 this week already. The dill I thought was growing in our herb garden was actually chives. The chicken stock I usually have on hand had magically disappeared. I knew the evening was off to a wrong start. The recipe was pretty easy and surprisingly, since I was missing so many ingredients, it came out really well. I loved the crunchy texture of the fried panko and the pork came out very moist. The sour cream was a really nice addition to the spiciness of the paprika and the milkiness of the pork. I served it with a classic frisee salad drizzled with olive oil, fresh squeezed Meyer lemon and a sprinkle of sea salt and pepper. Use a meat cleaver and pound the pork cutlets to 1/4 inch thickness. Set out 3 plates. One will have a mixture of flour, salt, and pepper. The second one will have the milk. The third will have a mixture of bread crumbs and paprika. Heat the olive oil in a large skillet on medium heat, do not allow it to smoke. Dredge the cutlets first in the flour, then the milk, and then the panko. Coat well. Sauté the cutlets for about 4 – 5 minutes on each side, until golden. You may have to work in batches if your skillet is not big enough for two at a time – we had too. Remove the cutlets from the skillet and cover with foil and keep warm in a preheated oven. While the cutlets are cooking, in a small bowl mix the chives and salt into the sour cream. 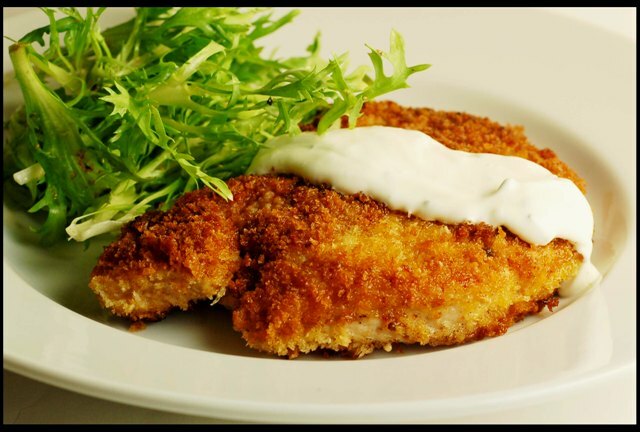 Serve the cutlets with the sour cream. 4 Responses to "Easy Homemade Pork Schnitzel"
This is such a coincidence. Mr. SGCC was just asking me to make schnitzel earlier today and I said I'd look for a recipe. Your timing is perfect and so is your schnitzel! It looks delish! That looks so good. FedEx some to us! :) My German friend said it's eaten with some kind of pasta. Don't know if it's only his mother that makes that...haha. Love your blog and pix... beautiful! To Joy-- the pasta that is traditionally served from my family's neck of the woods (Bavaria) is Spaetzle. Red cabbage is the perfect accompaniment. To make it authentic, you need a lemon wedge. I'm making this meal sometime this week, just like my "Mutti" taught me to. Though I'm switching to panko crumbs (which isn't authentic) because your photo made it look so good. As we say in Bavaria, "Malzeit"! My neighbors from Poland made this with flour and milk I think to make a sort of pancake batter. They pounded the pork and dipped it in and then fried them. Has anyone heard of doing it this way?